(Zank) Zank apparently traveled the world. At least that’s what he tells us on the CD jacket. 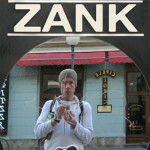 Good for Zank . . . I’m, admittedly, jealous. ‘Tis a pity, however, that the music of the countries he visited didn’t find its way into his songs, because then they would have been far more interesting. In all fairness, the songs aren’t bad, per se, and Zank‘s a fairly good musician. However, I found it too easy to tune him out while I did other things around my apartment. This told me that he just wasn’t holding my interest, despite the fact that this CD was playing on my computer quite audibly. College kids wishing to appear deep and sensitive while throwing a 4-kegger might enjoy him, but he couldn’t hold my attention.